Pedro Castle , November 9th 6.30. 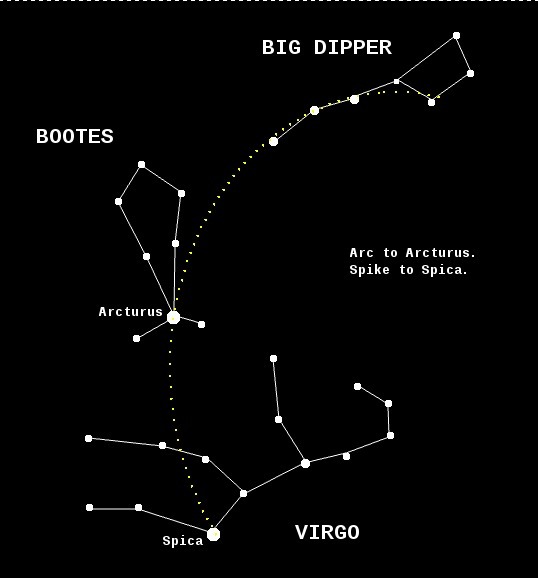 The illustration above comes from heavens-above.com, as it gives a picture of the most easily seen objects and patterns in the night sky for the day and time of the viewing session. If you don’t already use the website, I cannot recommend it highly enough. 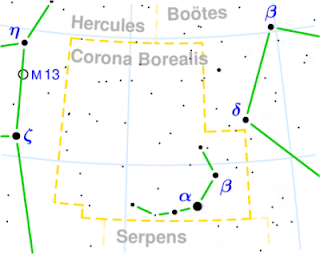 As shown, the small constellation Delphinus is directly over head. 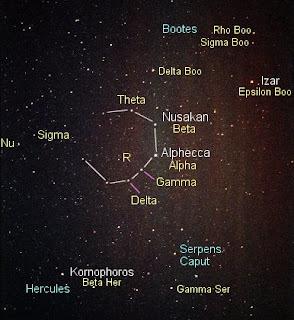 It is the small group of stars above the name on the chart above. It is on the edge of the Summer Triangle (see previous posts), and should be easy to find. Or so it looks. Delphinus is a constellation in the northern sky, close to the celestial equator. Its name is Latin for dolphin. It is one of the smaller constellations, ranked 69th in size out of 88. Delphinus was one of the 48 constellations listed by the 2nd century astronomer Ptolemy, and it remains among the 88 modern constellations recognized by the International Astronomical Union. Delphinus's brightest stars form a distinctive asterism that can easily be recognized. 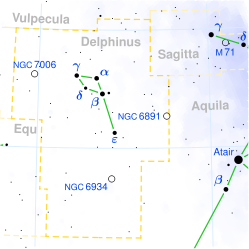 It is bordered (clockwise from north) by Vulpecula the fox, Sagitta the arrow, Aquila the eagle, Aquarius the water-carrier, Equuleus the foal and Pegasus the flying horse. 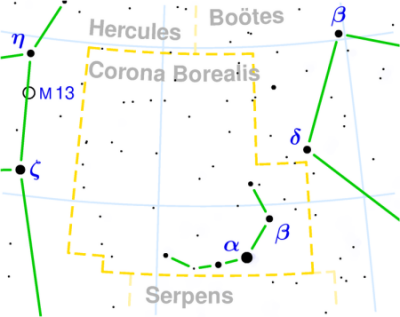 The two brightest stars of this constellation, Sualocin (Alpha Delphini) and Rotanev (Beta Delphini), are not, as one might expect, names dating from antiquity, but instead date from a star catalogue of 1814 that was published at the Palermo Observatory in Italy. When read backwards they form the name Nicolaus Venator which is the Latinized version of the name of the assistant director of that observatory at that time, Niccolò Cacciatore (both Cacciatore and Venator mean hunter). Delphinus is associated with two stories from Greek mythology. According to the first one, the Greek god Poseidon wanted to marry Amphitrite, a beautiful nereid. She, however, wanting to protect her virginity, fled to the Atlas Mountains. Her suitor then sent out several searchers, among them a certain Delphinus. Delphinus accidentally stumbled upon her and was able to persuade Amphitrite to accept Poseidon's wooing. Out of gratitude the god placed the image of a dolphin among the stars. The second story tells of the Greek poet Arion of Lesbos (7th century BC), a court musician at the palace of Periander, ruler of Corinth. Arion had amassed a fortune during his travels to Sicily and Italy. On his way home from Tarentum his wealth caused the crew of his ship to conspire against him. Threatened with death, Arion asked to be granted a last wish which the crew granted: he wanted to sing a dirge. This he did, and while doing so, flung himself into the sea. There, he was rescued by a dolphin which had been charmed by Arion's music. The dolphin carried Arion to the coast of Greece and left. 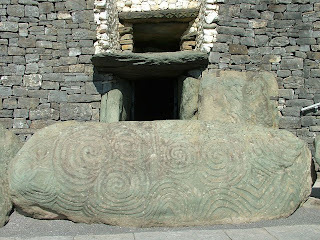 The asterism is rather curious, for its four main stars form a rectangle called "Job's Coffin". This is probably a hang-over from the time Delphinus was interpreted as a whale, as in Chapter 41 of Job where God challenged Job: "Canst thou draw out leviathan with an hook?" However there is no reference to Job being swallowed by a whale, as happened with Jonah, so the name Job's Coffin remains a bit of a mystery. Delphinus has several fine binaries and a very remote globular cluster. Beta Delphini is a very close visual binary with orbit of 26.7 years. Gamma1 and gamma2 Del form a fine binary with (perhaps) subtle colour change (observers argue over this; some find them both yellow, others that the companion is greenish or bluish). NGC 7006 is a very remote globular cluster, perhaps as far as 200,000 light years away. Because of its distance it is extremely difficult to resolve. 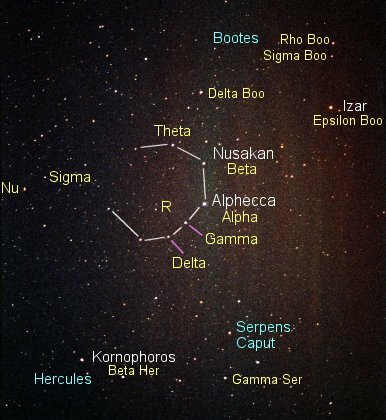 It is located fifteen arc minutes due east of gamma Delphini. Much closer, and much brighter, is the planet Jupiter, unmistakable in an area of dim stars. 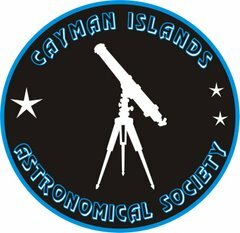 To compensate for the inclement weather conditions this year, we will be giving “An Introduction to Astronomy”, a presentation at the University College of the Cayman Islands, on Friday 26th November, 7.00 p.m. in the Cascade Room. Also, the society has a presence on Facebook now, feel free to join, and also the society. There is now a very real reason for joining, in that only paid –up members will be notified of viewing sessions at a very dark,private site with the automated Meade. NB: WE PREFER TO USE THE EMAIL ADDRESS AS THE PRIMARY CONTACT. Pedro Castle, Sunday, 16th May 2010, 7.30 p.m. The sky is brilliant in the early evenings this month with three planets and bright stars along the line of the ecliptic. The ecliptic is the apparent path that the Sun traces out in the sky during the year, appearing to move eastwards on an imaginary spherical surface, the celestial sphere, relative to the (almost) fixed stars. In astronomy and navigation, the celestial sphere is an imaginary sphere of arbitrarily large radius, concentric with the Earth and rotating upon the same axis. All objects in the sky can be thought of as projected upon the celestial sphere. 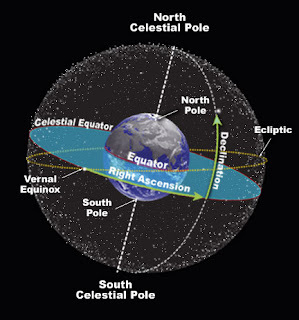 Projected upward from Earth's equator and poles are the celestial equator and the celestial poles. Most planets go in orbits around the sun, which are almost in the same plane as the Earth's orbital plane, differing by a few degrees at most. As such they always appear close to the ecliptic when seen in the sky. 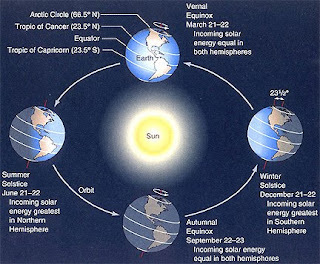 The name ecliptic arises because eclipses occur when the full or new Moon is very close to this path of the Sun. On the 16th, Venus will be close to the crescent Moon in the west. Moving eastwards along the ecliptic, the Twins of Gemini, Castor and Pollux, come before Mars. Saturn is roughly halfway between Regulus, in the constellation Leo, and Spica, α Virginis. 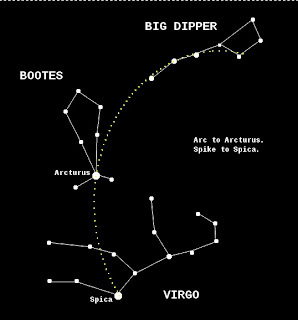 The distinctive constellation of Ursa Major is high in the north, and Crux, the Southern Cross is in the south.